• The African Aviation Tribune •: ■ RWANDA: AviAssist Foundation holds annual Airport Rescue & Firefighting ARFF course in Kigali. Tom Kok, AviAssist's Director, said the exercise was held in partnership with the Rwandan Civil Aviation Authority (RCAA) and Groningen Airport Eelde from the Netherlands. 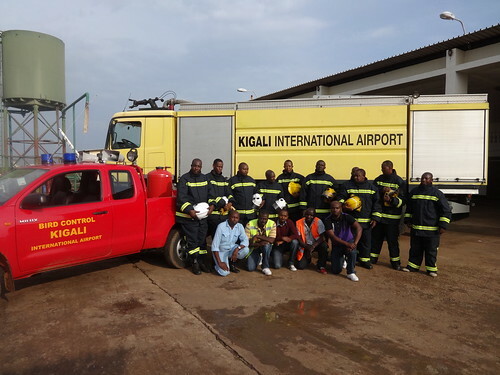 “Over the past week, Kigali International Airport’s fire fighters were trained in industry best practices,” reported Kok. “The International Civil Aviation Organisation ICAO has highlighted that, while many airport authorities are allocating resources for the procurement of fire fighting trucks, many were not allocating the required resources for the adequate training of the personnel. The same applies sometimes for the procurement of rescue tools and protective materials (helmets, boots, suits etc). We agree with ICAO’s position that, in addition to causing the ARFF facility to be very inefficient or even plainly ineffective, the morale of personnel is negatively affected. That is not something you can afford as an airport operator in relation to that crucial safety service,” he explained. Funding for the training was provided by the Rwanda CAA, Netherlands Ministry of Infrastructure and KLM Royal Dutch Airlines. AviAssist partner, Kenya Airways (KQ), provided all tickets. The support by the Foundation’s airline partners also demonstrates that AviAssist addresses priorities identified by the local aviation industry. “As part of our long term commitment to the region, we will continue our support to the professionals that attended the course through our social media channels which have an increasing membership among all levels of aviation organisations in Africa. We also do that with free subscriptions to our quarterly safety magazine SafetyFocus” Kok said. Kok ended by saying that while his organization is already in discussions with a number of airport operators in the region about hosting the next training course editions, AviAssist is still open to invitations from others in the sub-region.